This is a group for any tech professionals or political experts (or ordinary citizens) interested in discussing in a detailed way the potential opportunities for reforming existing democratic institutions; from local organisations to national governments around the world through technology or other practices. Our aim is to improve democracy: we think this can best be done by providing a forum for discussing democracy proposals, ideas, and to foster collaboration between people who would like to participate in democracy reform. 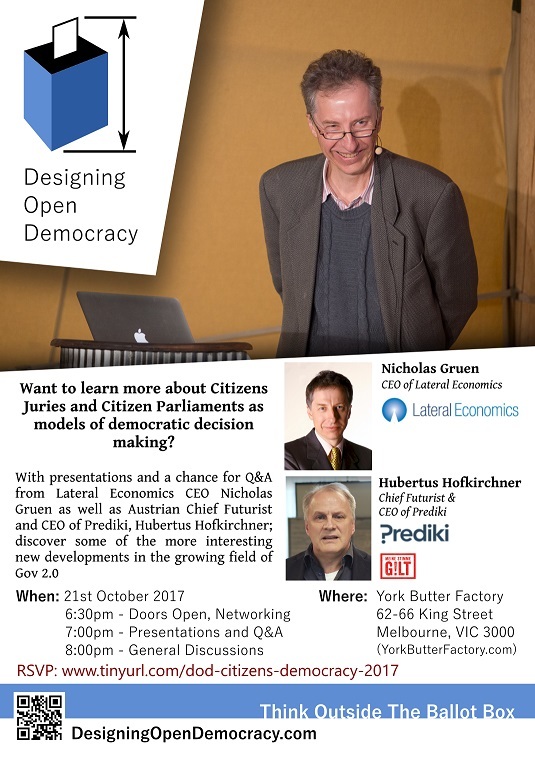 Designing Open Democracy will not presume any form of democratic system to be superior, but is a forum for discussion and practical planning on how such system may be implemented. In addition, this meetup will not be exclusive to any political party, but be a forum for members of various parties, groups and individuals to come together to trade ideas related to open democracy and evaluate their strengths and weaknesses. This may involve developing criteria and methodologies for evaluating potential implementations (e.g. election softwares or different ways of conducting governance). TL;DR: We are an advocacy group for promoting greater interaction between relevant stakeholders involved in developing a more unified and stronger democracy. The core organising team members is Brian Khuu and Simon Gnieslaw and Nick Merange, you can reach out to us via contact@designingopendemocracy.com. We also have members from various political parties and companies who we often consult for specific updates about various democracy related projects of interests. As well as to collaborate on how to best assist them in achiving a better democracy. Our online gathering place is in discuss.designingopendemocracy.com, where we can discuss in depth various projects and concepts. For our slack chat channel at opendemocracy.slack.com. For access, just post a request at our Discourse web forum above. As mentioned, it is a technical discussion group, so we expect to have detailed discussions about the technical practicalities of different systems and their merits and limitations. If this sounds like something that’s for you, we look forward to seeing you at one of our meetings! If you have any questions directly related to us that cannot be answered in our web forum then email contact@designingopendemocracy.com. We are always looking for new venues and interested groups!